No two words evoke emotion out college basketball fans more than "March Madness." Utter those words and fans, office workers, and handicappers from all around the country will immediately start trying to predict and bet on which team will cut down the nets and win the national championship. But is it legal to bet on March Madness in the United States? And — if so — where and how can you wager real money on the this year’s tournament? 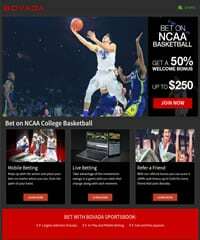 We’ll cover the legalities of betting on basketball and the NCAA Tournament in the United States, offer our tips and strategies, analyze why different strategies for betting on the tournament, and even a look at why so many people love betting on which college basketball teams will survive the Big Dance. Is it legal to bet on the NCAA Men's Division I Basketball Tournament in the US? Yes. There is no law in the United States that prohibits wagering real money on the NCAA Tournament at legally licensed offshore betting sites. State-licensed sports betting has been legalized in a handful of states following the repeal of PASPA. Check out our state guide for more information on the status of legal sports betting in your state. Bovada is the highest rated online sportsbook that caters specifically to US players. They currently offer a 50% matching bonus up to $250 to bet on March Madness basketball. In addition they also offer some incredible free contests and brackets to existing customers where players can win their share of over $25,000 in prize money. One of the reasons Bovada is so popular with players is due to the fact that in addition to sports betting, they also offer casino and poker action all from the same players account. And the fact that they are extremely reputable and pay off players like a bank makes them a perfect choice. Fans have various strategies for betting on their basketball brackets when March Madness rolls around, but let's be honest: Few of them are actually worth your time and any strategies “guaranteeing” a win on your bet is flat out lying to you. However, there are different ways to limit your risks and to increase your odds of success. Those are the methods we'll be covering below. During the 2018 NCAA tournament, the University of Maryland, Baltimore County Retrievers pulled off the biggest upset in March Madness history when they beat the Virginia Cavaliers by a score of 74-54 in the first round, becoming the first ever #16 seed to defeat a #1 seed. Many experts thought it would never happen, but the bettors who correctly predicted the upset and never said “never” were awarded huge payouts. But how often do upsets happen? It’s no surprise to see that the higher seeds have a higher winning percentage than their lower seeded matchups. Below is the overall record for each of the first round matchups since the tournament expanded to 64 (now 68 w/play-in round) teams in 1985. The important thing to remember is that there are four regions to the bracket and each one contains 16 teams, meaning there are four matchups between these seeds in the first round each year. For example, let’s examine the #5 Seed over #12 Seed matchup. The win percentage for the #5 Seed over the #12 Seed is 65.44% but there are four games in the first round that will have this specific matchup. Instead of looking at 65.44% as the odds for each #5 Seed to win, take 65.44% as the percent of #5 Seed teams that will advance to the next round. If the percentage was 75%, then, in theory, 3 out of every 4 teams with the #5 Seed would advance to the next round each year. When looking at the data for this specific example, it’s pretty safe to say that at least one of your bets in the first round should be on a #12 Seed each year and a second bet on another $12 Seed should at least be considered if you believe the team is being undervalued, since they have a roughly 40% chance to be the second team to pull off an upset. This was just an analysis for the #5 Seed and #12 Seed matchup and detailing the thought process of taking a win percentage and applying it to a bet on this year’s tournament. You can use any of the all-time records in the first round and see where upsets are likely to happen in the first round and increase the chance you turn a profit from your investment. It’s not a question of “if” there will be an upset in this year’s March Madness, but it’s a question of “when,” and when betting on games after the first round of the NCAA Tournament, things get a bit tricky due to the various combinations of Seed vs Seed matchups you can have. However, this certainly does not mean that we can’t find useful trends to apply before betting. Below is a breakdown of how many upsets you can expect to see during the tournament on average, including information on which years saw the maximum and the minimum number of upsets from that round. From the information, we can gather a ton of vital details. The first being that there are 12.2 upsets (lower seed defeats the higher seed) during March Madness each year, on average. In fact, the most interesting trend here is that the average number of upsets essentially get halved will each round, starting with 6.1 upsets in the first round, then 3.7 for the second round, 1.7 for the Sweet Sixteen, 0.5 during the Elite Eight, and finally 0.2 for the Final Four. Since we know that there are 32 games in the Round of 64 for example (2 teams per 1 game), we can divide the number of upsets by the number of games in each round to determine how many upsets you should expect to wager on each year. Surprisingly, upsets happen more often in the second round than in the first round and accounts for the highest percentage of games in the tournament has an upset. Upsets happen in the first round (19%) and the Sweet Sixteen (21.3%) roughly one-fifth of the time. However, the Elite Eight and the Final Four experience significant drop-off and if you’re someone who likes to bet on chalk, then these two rounds are for you since history has been generous to favorites. On average, there is only one upset in the Elite Eight every two years, according to the data, and every 2.5 years for the Final Four. This isn’t too surprising since the tournament has a way of narrowing down the field to where only the best teams remain. In summary, during the first three rounds, at least 20%-25% of your bets should be on the lower seeded team to pull off an upset if history is any indication. However, after those three rounds, change strategies and bet only chalk before the Elite Eight and Final Four are played since the higher seeded teams win 87.5% and 90% of the games in those rounds, respectively. After all, who wouldn’t like to win 9 out of 10 of the bets they place? Who doesn’t like free? 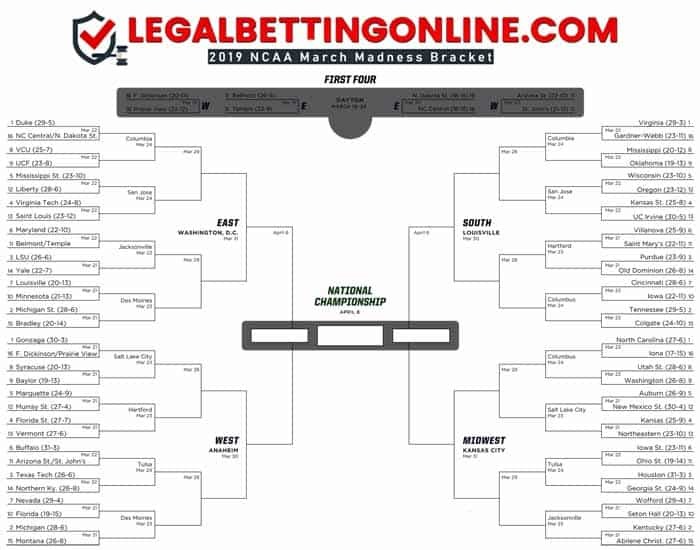 If you’re looking to fill out a 2019 March Madness bracket for free, then we’ve got you covered. Below you’ll find a link and the prize details to all the most lucrative contests on the Internet that do not require an entry fee. Details: $1 million guaranteed to the grand prize winner based on which bracket entry accumulated the most points throughout the entire tournament. Enter the contest here. Details: $100,000 awarded to the overall top scoring bracket entry. In-depth data analytics are provided for each entry for every team, player, and matchup in the tournament. Enter the contest here. Details: Cousin Sal’s Los Angeles Home or $1 million awarded to anyone who fills out a perfect bracket. If there is not a perfect entry, then $10,000 is awarded to the 1st place overall point scorer. Enter the contest here. Details: Four tickets to 2020 Final Four at Mercedes-Benz Stadium in Atlanta for the semifinal and national championship games, including $6,000 for luxury hotel rooms, roundtrip airline tickets, and transportation, is given to the winner, which is randomly selected among the top 10% of brackets based on overall points scored. Enter the contest here. Details: One trip for two to the 2019 Maui Jim Maui Invitational including roundtrip airfare, hotel stay for 5 nights, and $10,000 in Amazon gift cards. The winner is randomly selected among the top 1% of brackets points earned. Enter the contest here. Official March Madness Site - From news to tournament updates in real time, the official NCAA March Madness site has you covered. Follow March Madness On Twitter - Follow march madness on Twitter to stay in the loop on everything.